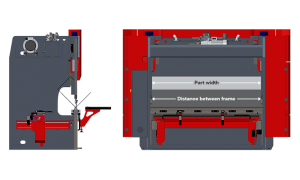 With three models available, the PBF 2560, PBF 30121, PBF 30200 this series of feature packed press brakes do not want for capabilities. The standard equipment list on these brakes does not read like a machine with a very competitive price. 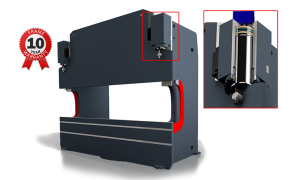 Starting with the Delem DA52s which is a 4 axis capable CNC controller, which commands 3 axis on these press brakes; Y1, Y2, X the quality component hit parade just keeps going on. Regardless of price, quality has to be built in; it can rarely be added on. 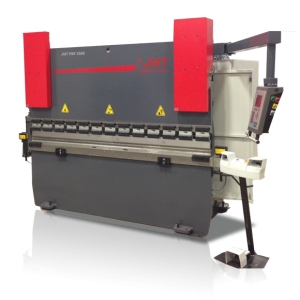 With that philosophy in mind, the JMT PBF press brake series incorporates major components like; Siemens main electrical elements, Fiessler laser safety systems, dual Opkon linear scales (on both sides of the ram), Hauptschalter switches, demonstrating a commitment to built in quality. All C.E. certified! Not enough for you, you say? How about this? Ground linear back gauge finger rail, ground and hardened tool steel double nut lead screw for back gauge positioning. Solid steel back gauge, no composites no aluminum. Stress relieved over weight machine base finished in a 5 axis milling machine. 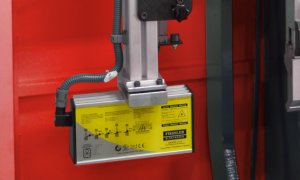 From the user friendly Delem CNC control to the who’s who list of quality components, it’s easy to see why JMT’s PBF series press brakes get the recognition they have received since their introduction to the market place. Request a quote from A.W MILLER today, you will be glad you did.